Last date for submission of Hard copy within 15 days from the last date of submission of online application. 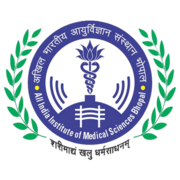 Eligible candidates may apply online at AIIMS Bhopal's website (direct link is given below) from 21 Jan 2019 to 06 Mar 2019. Candidates log on to http://www.aiimsbhopal.edu.in/. After applying online applicants need to send the hard copy/print out of online application form along with the printout of the online application form and the documents related to Date of Birth, Education Qualifications, Experience, No Objection Certificate, Vigilance Clearance Certificate, APAR/ACR for last 05 years to Administrative Officer All India Institute of Medical Sciences (AIIMS) Administrative Block, 1st Floor, Medical College Building Saket Nagar, Bhopal-462020 (MP). The application with all relevant documents should reach on or before within 15 days from the last date of submission of online application.